Found her on the 1910 Justice Precinct 3, Parker, Texas census (dist 74 img 9) as Caroline Finger age 79, step mother, living with Daniel A. Finger. Perhaps the middle initial C is for Caroline. Found her on the 1930 Utica, Oneida, New York census (dist 52 img 27) as Hazel Fingar age 35. Found her on the 1900 Marissa, St. Clair, Illinois census (dist 115 img 1) as Janie Finger age 34. Father, mother born Scotland. Found her on the 1860 Riga, Lenawee, Michigan census (img 8) as Alla Lewis age 55. Found him on the 1860 Liverpool, Fulton, Illinois census (img 59) age 6/12. Born, Illinois. Found him on the 1880 Putman, Fulton, Illinois census (img 2) age 21, occupation, work on farm. Found him on the 1910 Red Hook, Dutchess, New York census (dist 81 img 27) as Henry Brenzel age 37. Found him on the 1920 Red Hook, Dutchess, New York census (dist 71 img 10) as Henry I. Brenzel age 47, horse shoer own shop. Father, mother born Germany. Found him on the 1920 Gastonia Ward 4, Gaston, North Carolina census (dist 88 img 24) as Hall Crouse age 6 months. Found him on the 1930 Maiden, Catawba, North Carolina census (dist 22 img 15) age 10. Found her on the 1900 Buffalo Ward 18, Erie, New York census (dist 141 img 3) as Barbara Felix age 19, saleswoman. Found her on the 1905 Buffalo Ward 13, Erie, New York census (E.D. 02 img 14) as Barbara Felix age 23, house work. Address: 731 Jefferson. Found him on the 1910 Manhattan Ward 11, New York, New York census (dist 230 img 51) as Harry Finger age 10. Found him on the 1920 Manhattan Assembly District 6, New York, New York census (dist 484 img 2) as Harry Finger age 19. His WWI draft registration lists his occupation as farmer and his nearest relative as F. R. Finger. Found him on the 1900 Fountain, Juneau, Wisconsin census (dist 75 img 5) age 3. Found him on the 1920 Fountain, Juneau, Wisconsin census (dist 67 img 2) as Herbert F. Finger age 22, single, living at home. Possibly the Herbert Finger age 33 on the 1930 Hustler, Juneau, Wisconsin census (dist 9 img 1). Hyman E. Finger, one of the founders of Finger Furniture, died of a heart attack Tuesday at the age of 67. Finger, who was born in nearby Shepherd, Texas, sold his interest in Finger Furniture, one of the largest furniture firms in the nation, to his brothers 12 years ago. He then headed Office Furniture Showcase as well as becoming chairman of the board of Republic National Bank of Houston and joining his three sons, Jerry, Marvy and Ronnie, in forming Finger Enterprises, builders of homes, apartments, shopping centers, etc. He also was an investor in real estate and other ventures. He came to Houston in 1926 and started Finger Furniture at 2929 Main. He was joined in that venture by his brothers Aaron and Sammy, as well as his father, Sam. He was active in the Jewish Community Center, United Jewish Campaign, National Jewish Hospital of Denver, Arabia Shrine, as well as being a member of the Shepherd Lodge No. 866 Mason and Temple Lodge of Houston. Funeral services were held Wednesday at Congregation Beth Yeshurun. Interment was in Beth Yeshurun Cemetery, Levy Funeral Directors in charge. 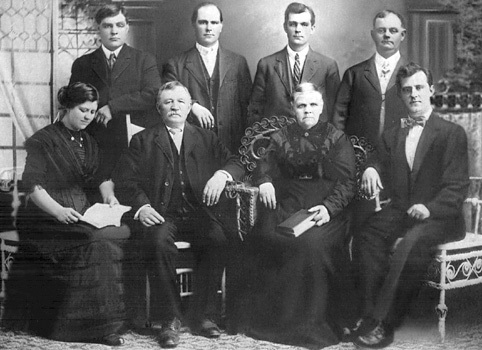 Survivors include his wife, Bessie Kaplan Finger; three sons, Jerry, Marvy and Ronnie; three brothers, Aaron of Fort Worth, Bernice of Shepherd and Sammy; and two sisters, Mrs. Joe Kost and Mrs. Jake Glick, all of Houston, and six grandchildren, Richard, Walter, Jonathan, Jan, Scott and Jill. Found him on the 1910 Justice Precinct 1, San Jacinto, Texas census (dist 101 img 13) as Herman Finger age 5. Found him on the 1920 Justice Precinct 2, San Jacinto, Texas census (dist 133 img 16) as Hyman Finger age 15. Found him on the 1940 Houston, Harris, Texas census (dist 258-259 img 32) as Hyman E. Finger age 35. Manager, furniture & radio. Prayers were said in the Donald M. Demmerley Funeral Home on Pierce Ave. last Monday followed by a Mass of Christian Burial in Saints Peter and Paul Church, for Walter A. Finger of Beverly Rd., who died June 19 in his 83rd year. Interment was in the church cemetery. Mr. Finger was a retired Bethlehem Steel Corporation employee and a member of Saints Peter and Paul Church. Surviving are his wife, the former Christena May, a son, Harold M. Finger, Boston and Hamburg public accountant and three grandchildren, Mrs. James Murrett, Thomas and Daniel Finger. Mr. Finger was also the father of the late Eugene Finger, a brother of the late Augusta Rogers, Charles and Albert Finger, and the grandfather of the late David Finger. - The Hamburg Sun June 26, 1980 page 4. Found him on the 1900 Buffalo Ward 14, Erie, New York census (dist 103 img 11) as Walter Finger age 1. Found him on the 1930 Hamburg, Erie, New York census (dist 411 img 1) as Walter A. Finger age 32, heater helper sheet mills. Father, mother born New York. Family 1 : Frederick Eli FINGER Jr.
Found him on the 1900 Maple Creek, Outagamie, Wisconsin census (dist 91 img 8) as Clayton Kempf age 22, single, living at home. Farm laborer. Found him on the 1910 Maple Creek, Outagamie, Wisconsin census (dist 144 img 6) as Clayton Kempf age 33, single, living at home. Farm laborer, home farm. Found him on the 1920 Maple Creek, Outagamie, Wisconsin census (dist 221 img 4) as Claton Kempf age 41, single, living at home. Farm laborer. Found him on the 1930 Lebanon, Waupaca, Wisconsin census (dist 20 img 4) as Clayton Kemps age 50, single, laborer, farm. He and his brother Albert are living with in the household of their sister Orell and her husband George Buboltz. Family 1 : Leverett STUPPLEBEEN Jr.
On her daughter Angie's death certificate she is listed as Sarah Lore. Found him on the 1920 Albany Ward 1, Albany, New York census (dist 5 img 12) as Leroy Mathews age 33, pharmacy, drug. He is single and living at home. Found him on the 1880 Dardanelle, Yell, Arkansas census (dist 218 img 26) as Arthur Moore age 2. Found her on the 1850 Saugerties, Ulster, New York census (img146) age 17. Found her on the 1900 Germantown, Columbia, New York census (dist 13 img 21) age 14. Found her on the 1910 Campbells, Blount, Alabama census (dist 19 img 9) as Leola Robinson age 6 months. Found her on the 1920 Moores, Blount, Alabama census (dist 3 img 3) as Leola L. Robinson age 10. Found him on the 1900 New Haven, New Haven, Connecticut census (dist 365 img 16) age 29, porter, depot. Also in the household is Martha M. Klunk, sister-in-law. Found him on the 1910 New Haven, New Haven, Connecticut census (dist 398 img 29) age 40, foreman, baggage railroad. Also in the household is Martha M. Clump, age 34, sister-in-law. 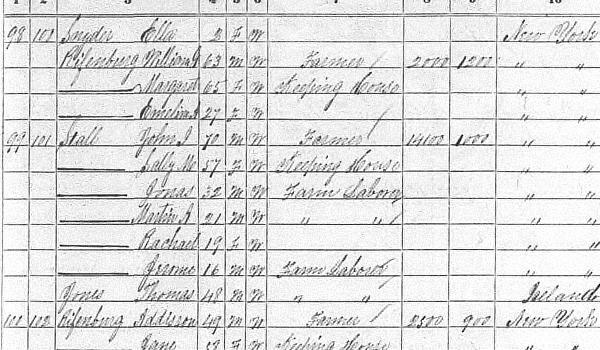 Found him on the 1850 Clermont, Columbia, New York census (img 10) as Jonas Stall age 12. Found him on the 1855 Clermont, Columbia, New York census (img 4) as Jonas Stall age 16. Found him on the 1940 Jerusalem, Yates, New York census (dist 62-12 img 14) as George Tears age 1. Found him on the 1860 Newton, Catawba, North Carolina census (img 4) age 2. Found her on the 1930 West Allis, Milwaukee, Wisconsin census (dist 392 img 32) as Erma Hockmuth age 28. Found her on the 1940 West Allis, Milwaukee, Wisconsin census (dist 40-91 img 45) as Erma Hockmuth age 38. Found her on the 1850 District 4, Bedford, Tennessee census (img 11) as Martha C. Woods age 13. Found her on the 1860 Conway, Izard, Arkansas census (dist 2 img 2) as Martha C. Woods age 22, single, living at home. Found her on the 1880 Salina, Onondaga, New York census (dist 194 img 6) as Sebilla Sthiasser age 41. Found her on the 1900 Salina, Onondaga, New York census (dist 76 img 20) as Sibilla Schiesser age 61. Found her on the 1910 Salina, Onondaga, New York census (dist 87 img 15) as Sybilla Schiesser age 70, widow, living with her daughter Anna and her husband Gottlieb Finger. Found her on the 1920 Salina, Onondaga, New York census (dist 98 img 16) age 80, widow, living with her daughter Anna and her husband Gottlieb Finger. Year of immigration, 1874.